Questions about how to best secure the U.S.-Mexico border are central to U.S. immigration policy and debates around reforming U.S. immigration laws. In fiscal year (FY) 2011, the U.S. Border Patrol began implementing what it terms the Consequence Delivery System (CDS), its first systematic attempt to employ metrics of effectiveness and efficiency to the different forms of removal and other enforcement consequences that migrants face after being apprehended at the Southwest border. This report presents findings from a year-long study that included analysis of previously unpublished CDS data provided to MPI by the Border Patrol as well as fieldwork in the Tucscon and Rio Grande Valley sectors, discussing which consequence measures may be most effective in deterring illegal migration. As the Border Patrol has shifted towards greater use of formal removal and away from voluntary return, its use of consequences and allocation of resources—including expedited removal, lateral repatriation, and criminal prosecution via Streamline—have been measured and guided by CDS. Overall, the share of migrants apprehended more than once in the same fiscal year fell from 29 percent in FY 2007 to 14 pecent in FY 2014. 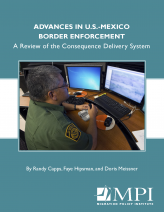 Ultimately, while CDS has become an important tool that informs Border Patrol priorities, the authors find that some of its underlying assumptions about effectiveness and deterrence may be less applicable to the U.S.-Mexico border today than in the past. The shift from majority Mexican arrivals to new and diverse migrant groups, particularly women and children fleeing violence in Central America, has both limited the consequences the Border Patrol can impose and revealed limitations in data collection. Tackling these challenges will be essential to future enforcement strategy and policymaking.